Kiwi Seeds cannabis seeds are unique. Kiwi saved the last good coffee shop strains and put down some very nice cannabis strains here. All strains they provide are of good quality and the plants are very stable. This brand delivers only feminized cannabis seeds. They have a few nice strains in their range which are suitable for an indoor and an outdoor grow. Daddy's Girl from Kiwi Seeds grows into a beautiful stable cannabis plant. These weedplants can handle the European climate and smoking this cannabis gives a strong up high feeling! Kiwiskunk from Kiwi Seeds contains all classic Skunk characteristiscs and qualities. The cannabis seeds can be grown indoor and outdoor. This weed is very popular due her full buds, her short flowering time and her amazing aroma! Mako Haze from Kiwi Seeds is a popular prizewinning cannabis strain with a high yield! She has a typical Haze flavor and gives a numbness and relaxed feeling. Milky Way fromKiwi Seeds is a feminised cannabis strain that is originated by crossing the best strains. The weedplants deliver big, tight buds with a high content of THC. Recommended for those who want to grow full and powerful cannabis! Mount Cook from Kiwi Seeds is a prizewinning cannabis strain that has proven her quality. The buds produce a high content of THC and CBD. The cannabis seeds are very suitable if you want to grow very powerful weed! Ray's Choice from Kiwi Seeds is a feminised cannabis strain that is originated by crossing two nice cannabis strains. The cannabis seeds can be used in an indoor, an outdoor and a glasshouse grow en grow into good weedplants! 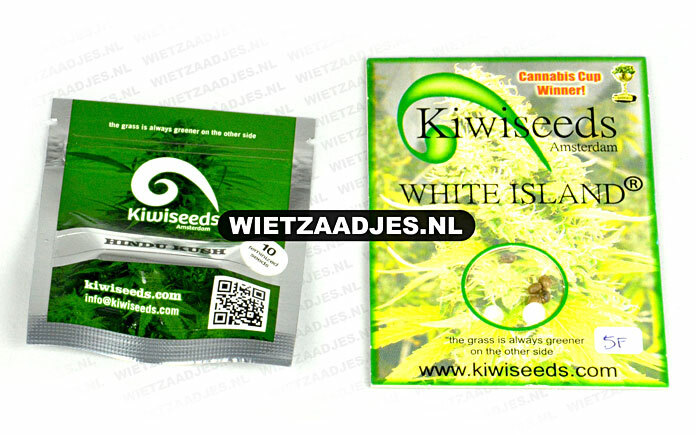 White Island from Kiwi Seeds is originated by crossing two nice cannabis strains. These prizewinning weed seeds are suitable for an indoor, a glasshouse and an outdoor grow and is very easy to grow. Ideal strain for the starting growers!